Star Jones tied the knot to Ricardo Lugo . 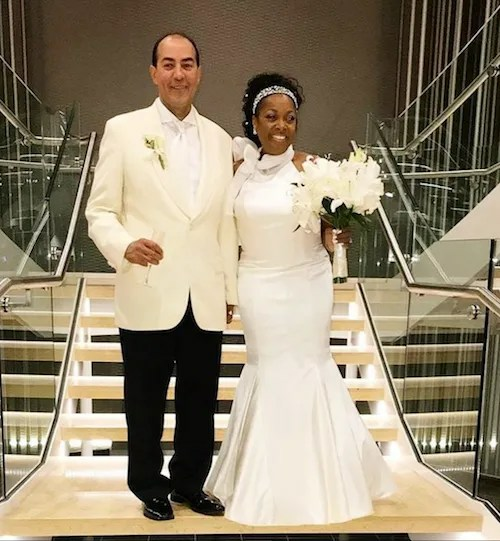 The happy couple, who got engaged in 2017, had their wedding aboard a Royal Caribbean cruise on Sunday, March 25, in the Bahamas. Ricardo and Star, 56, invited 150 of their closest friends to the epic destination-wedding soiree. Their high-profile guest list included Holly Robinson-Peete, Richard and Tina Knowles-Lawson and Real Housewives of Atlanta star Phaedra Parks! The dreamy cruise was actually a multi-day celebration for another important event — Star’s birthday! She wore a halter Dennis Basso gown which featured a bow neck tie detail and flared skirt, which she bought off the rack after speaking to Basso and asking the designer to choose a dress for her.